Barnacles are friendly people who form attachments very easily. A friend who is a barnacle is a friend for life. They are also known for being very amorous yet slightly stubborn. P.S. 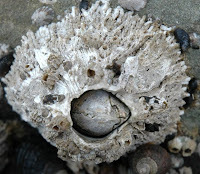 If you are among those who hold doubts as to the nature of the Barnacle's Molluskan heritage, please read this post, and hopefully that should clarify things. Again, since barnacles are not mollusks the chiton would be a better choice and would still fit your description. Chitons hold on really well to rocks and substrates.